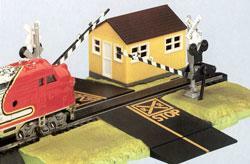 This is an HO scale Dual Crossing Gates with Track Section from Bachmann. Retail $51.00 SAVE 37% ! A little disappointed in this item. I expected the crossing arms to lower and stay down when a train passes but they jump up and down as the train cars cross the track. Kids like them however. Gates automatically lower as a train approaches. 9" straight E-Z Track with nickel silver rail. For use with Bachmann's HO Scale E-Z Track and most other brands. It can also be used with On30 scale trains. Realistic, non-operating railroad crossing lights. Molded and decorated road crossing base. Bachmann HO Scale E-Z Track. Assembly of House and Crossing Gates. This track section will work only with Bachmann's E-Z Track.